Acquired largely by accident at the library, Rise and Shine has quickly become the most-played kid music around home. 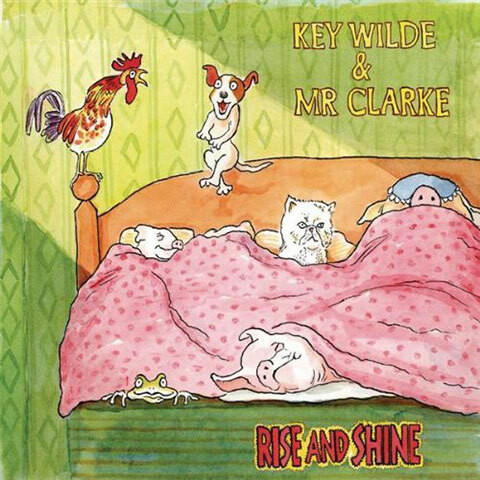 Wilde and Clarke sound like goofy Australians (in fact, goofy Aussie accents must certainly have something to do with the popularity of Australian children’s acts), but it turns out they’re located in New York, and their venture into kids’ music happened by chance (more history here). The whole album hangs well but there are some serious stand-outs: “The Rattling Can” is easily my 18-month-old daughter’s favourite dance track – and my favourite track too, I’m not ashamed to admit – while the Ramones-esque “Favorite Names” and lumbering “18 Wheeler” will undoubtedly be stuck in your head for days. Turn up your speakers for your toddler. Watch “The Rattling Can” live. Listen carefully for when he goes subatomic. Decide that was pretty good, so pick “I Had a Little Dog” in the related videos and enjoy the animation. Satiate your (toddler’s) appetite for more KW&MC with the whole album. Finally, realize this is something you need in your life, and just buy the album/board book. Decent. First few sips are the best. Gets a bit bitter after a while. Has a bit if “spice” at the tail end. 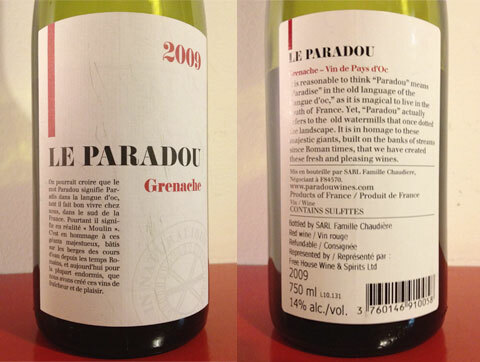 Nice with a steak dinner… But I got pretty sick of this stuff by the end of the bottle. ​I really enjoyed this. 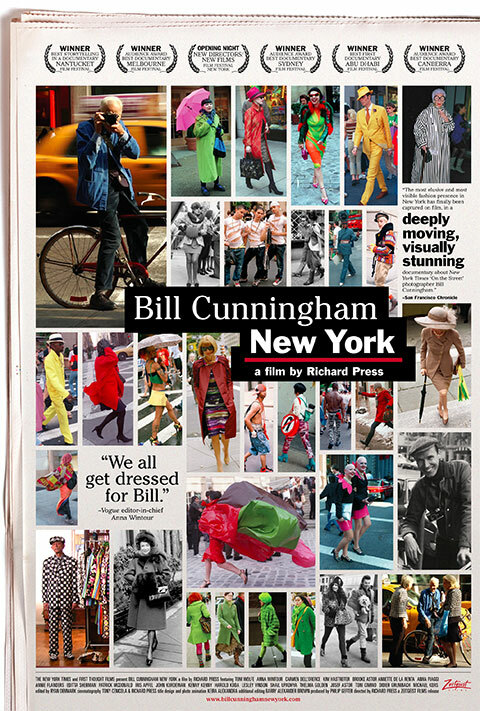 Bill Cunningham is a remarkably dedicated and passionate documentarian, commentator, and photographer of fashion. Somehow just “fashion photographer” doesn’t seem appropriate. What struck me most is that among a certain subculture, he is a king – “Please. He’s only the most important person on Earth,” says the French fashion show manager when some staffer isn’t taking his press badge seriously – but for the rest of us, he’s just a cute old man, riding his bike around New York, chasing pretty girls across crosswalks with a camera. Nevertheless, his accomplishments are wonderful and inspiring. Despite Bill’s apparent self-imposed austerity, he seems to be having a tremendous amount of fun living the perfect work-life blend. Bill turned 83 this year, but he’s still doing his “On The Street” pieces for the New York Times. Have a look… And watch this film! This is the third track from the new GY!BE just released today in North America: Allelujah! Don’t Bend Ascend. The whole album is big and beautiful. Highly recommended. Somebody left a bit of this at our place after Thanksgiving. 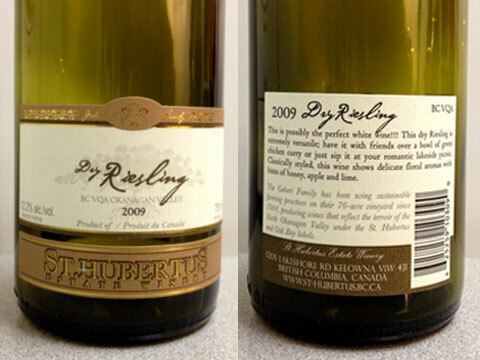 It’s not bubbly, but the flavour really sparkles! Almost like a nice apple juice or something. Very smooth. Nice aftertaste too. Enjoyable. I would buy this again! This chocolate was OK. 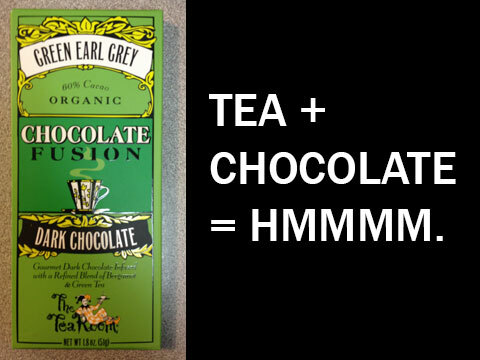 I think that, if I want tea in my chocolate, the chocolate should be sweeter. It’s like when you oversteep the tea and it’s a bit bitter (i.e. not great). I probably won’t buy this exact flavour again, but I might try one of this chocolate’s siblings. Nice packaging though! Finding it hard to believe that I’ve never posted a Dungen song before! The song’s lyrics focus on U.S. telephone area codes that denote the location of women with whom the singer has had sexual relations in cities across the United States. Because telephone area codes are increasingly becoming less constrained to particular geographic areas, scholars and cultural critics have noted that Area Codes may be incomprehensible to future generations of listeners. Thank you, scholars and cultural critics. 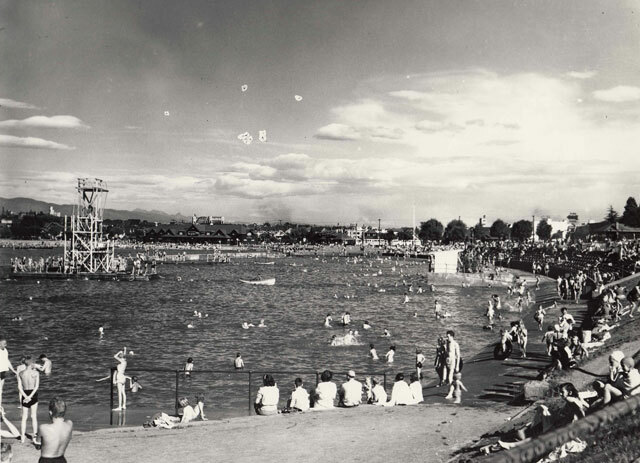 In preparation for an outdoor pool sojourn with my 14-month-old, I came across some great pictures of the original draw-and-fill pools at Kitsilano Beach and Second Beach. At the beginning of the week, the tide would fill up the pool, and the sun would warm the water over the following days. At the end of the week, the water would be let go, and they would refill again. I’m pretty sure that the original pool boundary is now the small concrete barrier of the seawall path along the perimeter of the present-day Kits Beach pool. Was just flipping back through my “Music To Acquire” list and came across this Prince Language edit, probably jotted down 4-5 years ago. Then realized that this has the same roots of as “Feel It All Around” by Washed Out (otherwise known as the Portlandia theme music). Prince Language’s track, however, is the more obvious edit of Gary Low’s “I Want You” (1983), which appears to be the origin of the sample. Depending who you ask, some fingers even point at Human League’s “Don’t You Want Me” (1981) but I’m not sure I’d go that far. ShiftIt is my favourite recently added free utility for Mac OS X. Having worked full-time on a Windows machine for the past 3+ years (a real throwback to my engineering days, before I converted to Macs), I have to admit I sorely missed the Aero Snap feature when I sat down to my machine at home. (In case you don’t know about Aero Snap, see these handy shortcuts.) This is super great for working with side-by-side documents on today’s wide-screen monitors, especially if you have a large screen. ShiftIt replicates this behaviour—albeit with a more complicated keyboard shortcut, by default—and adds a few more window location functions such as half-screen top and bottom, quarter-screen quadrants, and a quick full-screen shortcut (just maximized; not the crumby Lion full-screen “feature”). The only downside is that it doesn’t seem to work with Acrobat, but let’s blame Adobe for that. Loved this. Seriously high stakes drama. Yes! Yes! A million times yes! From the archives! I actually first heard this on a paper-thin vinyl promos from an old Levi’s ad campaign in Sleazenation (circa 2000). I liked the track so much, I e-mailed the guy (aka Kristinn Gunnar Blöndal, aka KGB) about a supposed future full-length, but it never came. The closest we ever got was this 7” single (“Motion Control” was the B-side) and a couple tracks on a compilation from Moshi Moshi Records: We Got Monkeys: Five Years of Moshi Moshi Records. > be the first 12” single. Detalis are sketchy but these are the facts. Of all the songs in my collection, this is probably among the top 5 most beautiful songs.